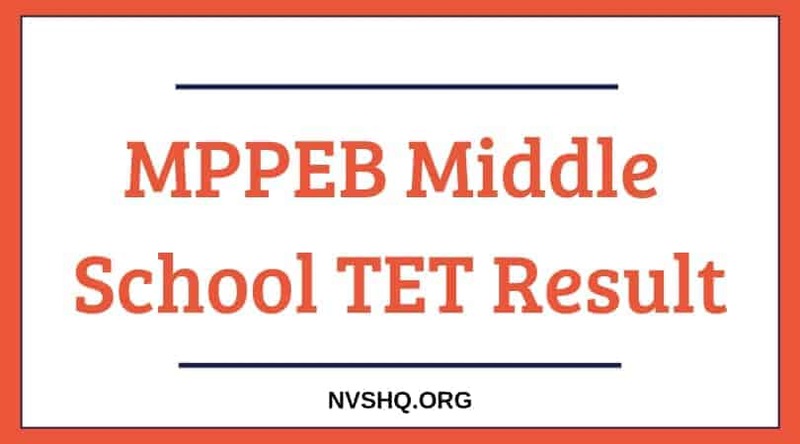 MPPEB Middle School TET Result 2019: The Board has recently published the answer keys for TET examination and this indicate that evaluation process has been completed or is under processing and the result is about to be declared in a couple of days. MPPEB TET result for the year 2019 is expected to release soon. The result will be made available on the official portal of the conducting Board and we will also upload direct link to it in this article. 2 How to download MPPEB Middle School TET Result? Madhya Pradesh Professional Education Board (MPPEB) has conducted the Teacher’s Eligibility Test (TET) for Middle School teachers in the month of February-March 2019 in various shifts across the state of MP. After this examination, TET certificates will be allotted to the qualified candidates and those who will also fulfill the recruitment criteria will fill the 5670 vacant seats in various schools of the state. Board will publish the result or the merit list through the online mode. It will not send physical result to any of the candidates through post or other medium. It is the responsibility of the candidates to access their result from the official portal of the board. Before the declaration of result board will notify candidates about the result through it portal. Candidates, therefore, are advised to stay in touch with the portal to get all the latest updates regarding TET result. Only those candidates who will secure the minimum qualifying marks will be able to pass this eligibility test. Only qualifying candidates will be listed in the merit list. The qualified candidates will become eligible to get TET certificate. The minimum qualifying marks of the candidates will be considered only up to the two decimal place of the marks obtained in the TET exam. There will be no provision for round off the marks obtained. How to download MPPEB Middle School TET Result? The result for Middle School TET examination for the state of MP will be published on the official website of MP PEB board on the notified dates. Examinees are required to download the subject-wise result from the portal. Candidates who are waiting for the disclosure of the merit list or result can needs to follow the given procedure to access the online result. Candidates have to start by visiting MPPEB official website (http://peb.mp.gov.in/). On the homepage of the portal, they have to click on the “Result” tab. They have to select the TET Middle School Result link. After that, they have to click on the respective subject for which they have applied. Candidates can download the merit list/result sheet for further references. MPPEB Middle School TET result will be published in the form of merit list as mentioned in the official notification. The merit list will be released subject-wise for all the categories of the candidates participated in the examination. The MPPEB Middle School TET merit list will indicate the subject-wise result of Schedule Caste (SC), Schedule Tribe (ST), Other Backward Classes (OBC), Unreserved (UR), Female candidates, Physically Challenged candidates, Guest Teacher, etc. The merit list also includes the names, roll number, category, etc. details of the candidates. After the declaration of result, TET certificates will be issued to qualified candidates. Candidates are advised to meet or contact the concerned officials in order to procure the TET certificate. TET certificate indicate that the candidates is eligible to teach students of a particular section/class in a school. Mere qualifying TET examination does not entitle candidates to claim for the appointment for the job of Middle School Teacher. Selection will not be made only on the basis of TET result; other factors will also be considered. The decision of the selection of eligible candidates for the post of Middle School will be made by the respective School department. For more information, related to the selection for the respective job, candidates must contact the concerned authority or school. Board is only responsible for conduct of examination and publication of result/merit list. Answer key for Middle School TET examination has been released by the Board. The answers keys to all the subjects and shifts are currently available on the official website of Board. Those who have not checked the same yet can check it before Board removes it from the portal. For the all the examinations conducted in various shifts, Board use a system of Normalization of marks for the result of the exams. As MPPEB TET exam was also conducted in various shifts, result will be prepared on the basis of normalization of marks. For more details on normalization of marks, system candidates can visit official MPPEB website. If you have any query, you can type it below and our team will reply below regarding MPPEB Middle School TET result and merit list 2019.